What Gobles Gobble: What in the name of mystery meat was I thinking? So in the spirit of not eating bacon, I was open to the idea of trying turkey bacon. . Yes it has the word bacon in it but let’s face it, it’s not bacon! Dea made BLT’s for dinner last night and thankfully all the condiments covered the fact that this was the most ridged flavorless stick of paper thin fake meat I have ever seen. OK its real meat, but dang it, it’s not pork! It’s like they didn’t even try to make it fool you into thinking it was either. It seriously tasted more like an over cooked deli ham with no salt than bacon. At first while I ate I smiled and told Dea and myself it wasn’t too bad, but the fact is it was terrible! I just know somewhere in heaven there is a piggy looking down on me from a cloud with a single tear in its eye. “Steve no”! it says. “I gave my delicious life so you would never have to suffer at the hands of turkey knock off meat products”! I have shamed myself and that poor little piggy. I was better off sticking to the “NO” bacon at all rule I set myself and believe me in the future I will stick to it like pre chewed gum to your shoe on a hot Nevada afternoon. I did Dea a favor and ate the left over’s because it was so badly dried out it was hurting her teeth! I had her make me some toast and butter it up and throw the left over’s on there. I was hoping the extra fat would elevate it a little and in a way it did seem to help. The moral of the story is, 1. Bacon cannot be substituted. 2. Turkey belongs in its white meat form on bread or smothered in gravy only! 3. If you’re so worried about your health you decide to give bacon up for a month, just give it up! My advice don’t ever eat this stuff ever! Switch to something lean like ham steak if you must Canadian bacon if your desperate, but keep it in for pork family. No more weeping piggy’s, I can’t take it! Just read this.... hilarious!! 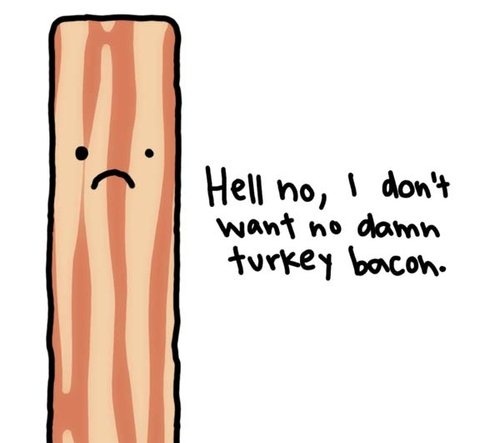 You and Dan would have a field day talking about bacon!